Budget required for implementing the final phase of Isfahan Healthy Heart Program (IHHP) was appropriated in 2007 and the post-intervention phase began. All the required data were collected and a number of surveys were simultaneously undertaken. During 2008, all data were processed and managed. Analysis of results began in 2009. IHHP external evaluation was conducted in May 2009, upon conclusion of the final phase. The implementation and research components of IHHP were evaluated and a report was performed by two experts from the National Institute for Health and Welfare of Finland (CLICK HERE). In cooperation with Isfahan Municipality, a Healthy Heart Station was set up in one of Isfahan’s well known parks. The goal is to educate heart patients and their families about prevention of cardiovascular diseases. Isfahan Heart Friends Association was established in 2000, concurrent with the World Heart Day. The goal is to educate heart patients and their families about prevention of cardiovascular diseases. Members of this association include heart patients and their family members, physicians and other health professionals. The association organizes regular monthly meetings, followed by group exercise sessions supervised by specialists. The participants in the meetings are then treated to IHHP healthy breakfast. These meetings are sponsored by members of the association themselves. The association has nearly 1000 members and different organizations, including the provincial television and radio network, municipality, public exercise groups, etc. cooperate with it. The association has played a prominent role in IHHP’s implementation, especially in projects targeting high-risk individuals. 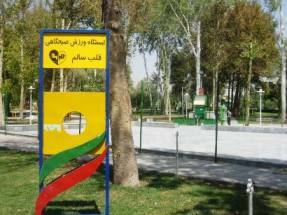 Negotiations with Isafahan municipality led to designation of the associations regular public exercise area in one of the city’s parks, as the “Healthy Heart Exercise Station”. - Sarrafzadegan N, Azadbakht L, Mohammadifard, et al. “Do lifestyle interventions affect dietary diversity score in the general population?”. Public Health Nutr 2009; 23:1-7. - Roohafza H, Sadeghi M, Shirani S, Bahonar A, Mackie M, Sarrafzadegan N. Association of socioeconomic status and lifestyle factors with coping strategic in Isfahan Healthy Heart Program. Croat Med J 2009; 50(4):380-4. - Rabiei K, Kelishadi R, Sarrafzadegan N, et al. “Process evaluation of a community-based program for prevention and control of communicable disease in a developing country: The Isfahan Healthy Heart Program”. BMC Public Health 2009; 9:57. - Mohammadifard N, Kelishadi R, Safavi M, Sarrafzadegan N, et al. “Effect of a community-based intervention on nutritional behavior in a developing country setting: the Isfahan Healthy Program. Public Health Nutr 2009; 17:1-9. - Kelishadi R, Sarrafzadegan N, Sadri GH, Malekafzali H, Amani A, Moatarian A, Baghaei A, Khosravi AR, Bahonar A, Heidari S, Rabiei K, Mohammadifard N, Rezaei-Ashtiani AA. Short-term Results of a Community-based Program on Promoting Healthy Lifestyle for Prevention and Control of Chronic Diseases: IHHP. Asian Pacific Journal of Public Health. - Sarrafzadegan N, Kelishadi R, Siadat Z, et al. Obesity and cardiometabolic risk factor in a representative population of Iranian adolescents and adults in comparison to a western population: the Isfahan Healthy Heart Program. Public Health Nutrition.